Newcomer Casper Chapel will host a Celebration of Life Service on Friday, January 11, 2019 at 1pm for Joseph Allen Wilson. 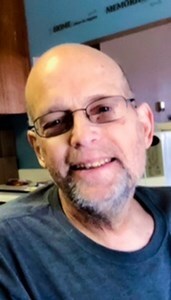 Joe passed away peacefully, from a courageous battle with cancer, in the care of his family and Central Wyoming Hospice, on November 29, 2018. Joe was born on June 24, 1957, in Casper, Wyoming to Marvin and Mary (Moore) Wilson. In his youth, Joe participated in Casper Boy Scouts Troop and the Order of the Arrow. He and his family were active members in the St. Anthony’s Church and School community. In high school, Joe competed on the NCHS gymnastics team and as a cross country runner. He graduated from Natrona County High school in 1976. Joe learned about the art of construction from his father and other mentors. He built, finished or renovated many homes and buildings in the Casper area. While living in Oregon, Joe taught these skills to other young men learning the trade, while he studied AutoCad. He was excited to continue his studies at Gillette College, where he had begun designing blueprints for new construction. Joe will be remembered, fondly, for his sense of humor, perseverance, faith, and hope. He will be missed by his children, family and friends. Joe is proceeded in death by his parents, Marvin and Mary Wilson, an infant sister, and several of his Aunts and Uncles. Joe is survived by his children; Alicia Wilson of California and Joe Wilson II of Missouri. His siblings include; Chuck Wilson, Caro (Hank) Washut, and Patti (Dave) Axmacher of Casper; Don (Elisa) Wilson of Montana, and Paul Wilson of Oklahoma. His grandchildren include: Joe, Aidden, Eva, and a new baby in February. Joe and his family were blessed to receive assistance and counsel from so many wonderful Wyoming organizations and their staff: Central Wyoming Hospice, Pastor Joseph Pomroy of Highland Park Community Church, Elkhorn Rehabilitation, Rocky Mountain Oncology, Meals on Wheels, CATC, Celebrate Recovery, Journey Church of Gillette, 2nd Chance Ministries of Gillette, Community Action, Wyoming Medical Center, Wyoming Independent Living, and Elite Therapy Health Services. We remain truly grateful to all those on this short list and to the many others who provided support care that we may not have listed. To share your memories of Joseph or leave a special condolence message for his family, please click the Share Memories button above. Add your memories to the guest book of Joseph Wilson.